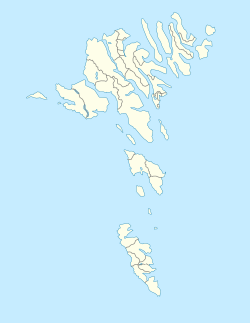 Tórshavn (IPA: [ˈtʰɔuʂhaun]; Dens: Thorshavn) is the caipital an lairgest toun o the Faroe Islands. It is locatit in the soothren pairt on the east coast o Streymoy. Tae the north wast o the toun lies the 347-metre (1,138 ft) heich muntain Húsareyn, an tae the soothwast, the 350-metre (1,150 ft) heich Kirkjubøreyn. The ceety itsel haes a population o 19,000 (2008). The ceety wis foondit in the 10t century. A panoramic picture o Tórshavn. The Vikings established thair parliament on the Tingenes peninsula in Tórshavn 825, sicweys Tórshavn wis made caipital o Faroe Islands an haes remained sae iver syne. Aw throu the Middle Ages the narrae peninsula juttin oot intae the sea made up the main pairt o Tórshavn. Soorces dae no mention a biggit-up aurie in Tórshavn till efter the Protestant Reformation in 1539. Early on, Tórshavn became the centre o the monopoly tred, therebi bein the anerlie legal place for the islanders tae sell an buy guids. In 1856, the tred monopoly wis abolished an the islands wur left open tae free tred. The toun haes grown rapidly iver syne the turn o the 20t century intae the undisputit admeenistrative, economic an cultural centre o the Faroes. The name o the toun means Thor's Harbour, an it mey be named efter the god o thunner an lichtnin in Norse meethology; sicweys the toun's coat o airms shows Thor's hammer Mjolnir, but mair likely it wis named efter the first settler whose name then wis Thor. The Faroese uisually refer tae thair caipital as Havn - harbour. Wikimedia Commons haes media relatit tae Tórshavn.